Q. Which phones can you charge? A. Our lockers contain a USB charging point. Q. How big is the locker? A. You can rent a regular locker (22cm wide, 15cm deep and 9cm high, suitable for keys, phones and wallets. 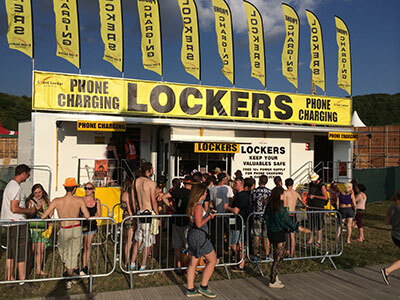 Our Larger lockers are: 22cm wide, 15cm deep and 29cm high, you can upgrade to a larger locker at the event, extra fee applies and limited availability. Q. How do I book my locker? A. For some festivals you can book as part of the ticket package, other wise you can book in advance on our website or come on the day. Q. What level of security is there? 1. Enter through our turnstiles using your fingerprint. 2. Use your key to open your locker. Q. Do I need to supply my own padlock? A. You can use your own padlock 30mm or less or leave a £5 deposit and use one of ours, deposit refundable on return. Q. Can I share my locker? A. No the locker is for the registered user only. Q. What happens if I forget my pre-booked ticket? A. As long as you can tell us your Email address and contact details then you can still use the locker but it will take longer to register and if there is a queue you may need to come back later. A. The cloakroom is only accessible to our staff.